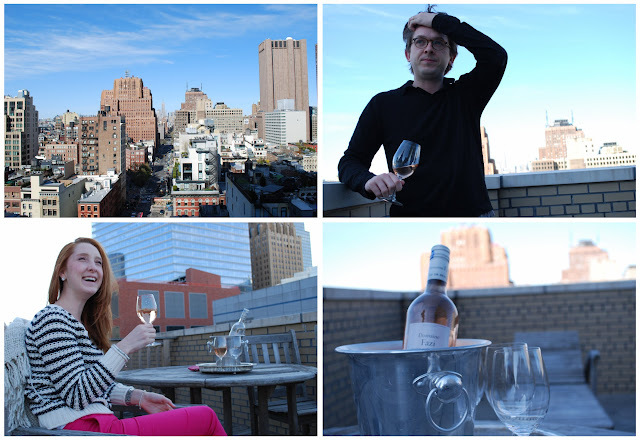 I find myself relaxing before dinner on a rooftop with friends at the southern tip of Manhattan, sipping rose, gazing north towards the city that has stimulated my appetite and my ambition since we first 'met' last year. I am here for a week over Easter - eager to experience the city, drink it all in and let it seduce me as it does: in small bites, chance encounters, glasses raised, and avenues traversed. Easter Sunday my friend M. and her husband were invited to an Easter dinner and, in true New York hospitality fashion, an extra chair for 'my friend from out of town' was added. I don't think it hurt that I was advertised as a food enthusiast who would gladly bring her famous homemade ricotta. I felt immediately welcomed into the fold of this assortment of friends. 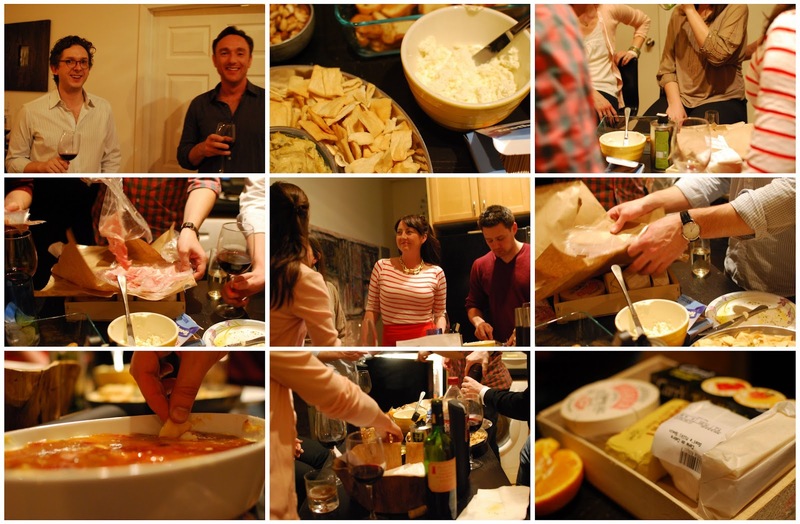 Nothing brings lawyers, writers, actors, musicians, and actuaries together quite like good food, prepared with love. 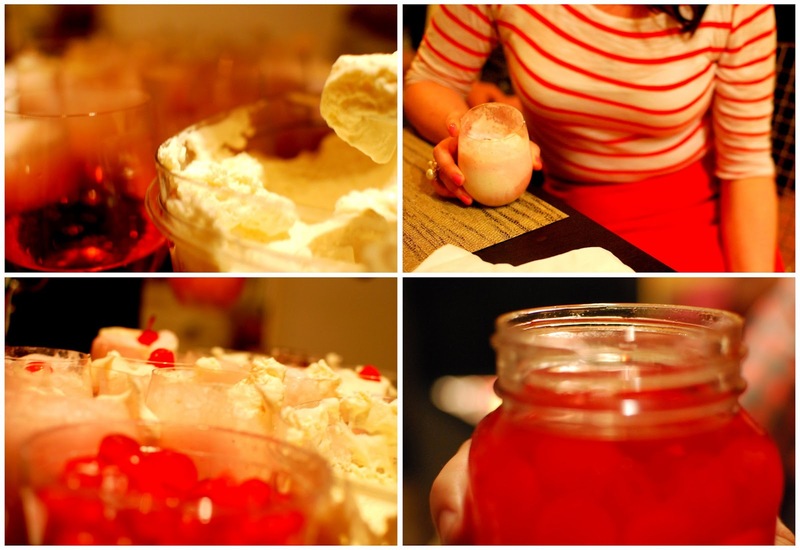 And nothing cements new friendships quite like freeflowing wine, excellent cheese, and homemade Manhattan floats - cherry soda topped with a boozy bourbon ice cream, a sumptuous dollop of vermouth whipped cream and a cherry drunk on moonshine. It was obvious that L. and S., our hosts, had abandoned themselves wholeheartedly to the caloric beckonings of high quality ingredients. They cooked with a happy sense of indulgence I immediately resonated with. The kitchen island was magnetized by the selection of delicious hors d'oeuvres and we swarmed around it, eagerly sharing tastes and introductory handshakes. Crostini were smeared with fresh ricotta , salt and pepper, and a drizzle of olive oil imported from M. & T.'s honeymoon in Greece. Pita crisps were dipped into baked goat cheese, topped with sweet hot pepper jelly. Brown paper packages were untied to reveal paper-thin wisps of salty prosciutto, and jalepenos added a kick to some spicy hummus. We sat down at a long table, beautifully set, to a starter of fresh mixed greens topped with rounds of lightly fried goat cheese and a creamy champagne vinaigrette. A ham was pulled out from where it had roasted in the oven all afternoon: cross-hatched and caramelized with a Dr. Pepper (!) glaze. 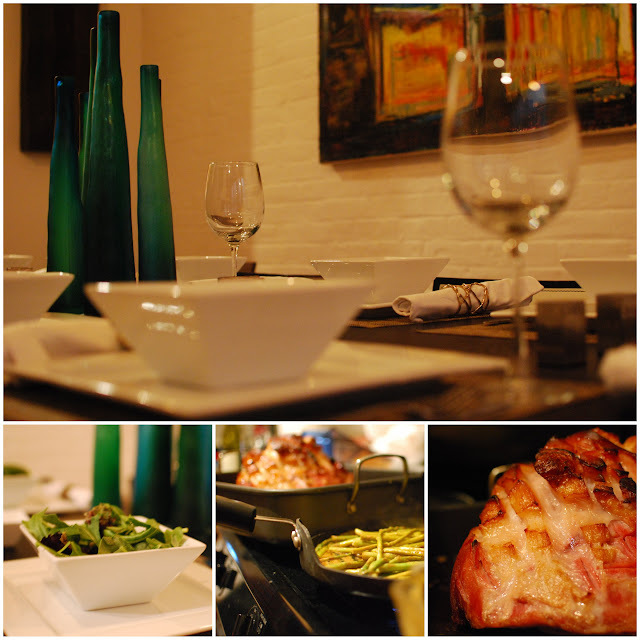 The ham was served with sides of grilled asparagus in a mayo dressing, a creamy mac & cheese, and a fingerling potato salad with crumbly bacon and grainy dijon clinging to each bite. 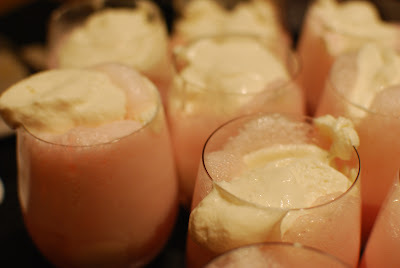 Already fully enchanted with the evening's previous indulgences, and well lubricated by the frequent uncorking of tasty wines, my taste buds were further flirted with by the proffering of a pre-dessert Manhattan Float. This fizzy, creamy, cherry-kissed confection was the literal 'cherry on top' of a wonderful evening. Dessert, which after the floats was entirely superfluous but also entirely welcome, was a bacon bourbon brownie served with homemade salted caramel ice cream. Thank God Manhattan was made for walking. In a food processor, combine ice cream and bourbon until just blended. Transfer ice cream into a shallow container, cover, and freeze until firm enough to scoop (about 30 minutes). Whip the cream with vermouth, sugar, and bitters until firm. Chill. To serve, fill glasses 2/3 full with cherry soda. Add a scoop of ice cream on top and a dollop of whipped cream. Garnish with cherries and prepare yourself for giddiness in the form of dessert - these Manhattan floats taste like being at an amusement park feels and are sure to bring a smile. It was one of many amazing taste experiences I had while I was there...will be posting about more soon!! !